How to Fix This Site Can't be Reached Error on Chrome? 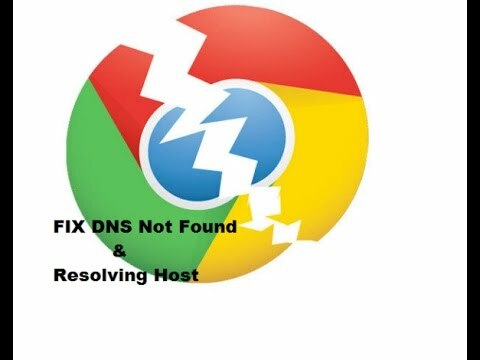 Fix Server DNS Address Could Not Be Found and This Site Can't be Reached Chrome Browser. Also, fix ERR_NAME_NOT_RESOLVED. Many a time you may face some annoying issues of Server DNS not found, ERR_NAME_NOT_RESOLVED, Site cannot be reached err_connection_timed_out, took too long to respond, Fix “Aw, Snap!” page crashes and other page loading errors etc.
. DNS actually stands for Domain Name Servers which loads the web pages from the host (the one where web pages are stored in the cloud). If you have a slow internet connectivity or due to some other issues your browser may show up an error and may not be able to connect to the host. This can happen even if you have a very good internet connectivity. Today I have come up with a couple of fixes to solve the issue. This is one of the easiest and most useful fixes to stop the issue of DNS servers. Simply visit the URL ‘chrome://net-internals/#dns‘. Click on Clear-Host Cache button next to Host resolver cache. You will notice the websites are working properly. Look for the option called Internet Protocol Version 4 (TCP/IPv4). Click on it and click on the properties button. Restart the browser and check websites. Go to settings of Chrome. Scroll down and click on Advanced settings. Simply uncheck the box and restart the browser. Here is the video tutorial to fix the chrome server issues. Restarting the DNS client can also fix the ‘DNS probe finished’ error on your PC. Press Windows Key + R → type services.MSC → Hit Enter to open Services window. Find DNS client and right click on it. From the options, click on Restart to restart the DNS client. Done!! If the methods above don’t work for you then try some other methods listed below. Some people reported that after uninstalling their Antivirus program (mostly McAfee) the problem was gone. Disabling the firewalls may solve the problem as some app may interfere when the Chrome is trying to connect. This could be the solution for you too. Disable your firewall and check for the error. Boot your computer into safe mode and try to load Chrome. This will help you determine if any third party software is causing the issue as the safe mode will only consist of inbuilt useful files. To do this reboot your computer and hold down the F8 key. Then select Safe mood with networking from the list of options. Note & Conclusion: I hope the post was helpful, do comment below for any assistance required in fixing the DNS error issue. If you've any thoughts on Fix – Site Can’t be Reached: Server DNS Address Could not be Found, then feel free to drop in below comment box. How to Fix Windows Boot Startup Repair Recovery Error? Why is it not working in my pc? The URL mentioned (“chrome://net-incternals/#dns”) should actually be “chrome://net-internals/#dns”. A ‘c’ was inserted into “internals” for some reason. Thank you so much for the tip on using camand prompt! i did it to my pc and it worked by not on my mobile phones. my cousin’s mobile phone is working fine, we are using the same network. How do you solve this on Chrome for mobile? I’ve cleared the host cache, turned off the prediction service, and turned my mobile network off and tried my wifi… nada. Try DNS Changer App available on Google Play Store.